The first time I’ve heard about this term ‘public intellectual’ was when I first came across Jean Paul Sartre biographical books in Kinokuniya, KLCC one year ago. I tried to read his book-Being on Nothigness which of course I can’t simply comprehend till today. At first I cannot understand why the Westerners really uphold Sartre. Later on as I read Frantz Fanon and Ali Shariati books I start to understand that Sartre influences was quite widely accepted among those Third World intellectuals in their struggle against colonialism. 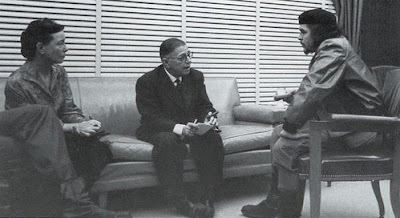 Simone de Beauvoir, Sartre and Che Guevara in Cuba circa 1960 having a philosophical discussion. I wish I could be there during that time! "It is not the same thing if I sign Jean-Paul Sartre or if I sign Jean-Paul Sartre, Nobel Prize winner. A writer must refuse to allow himself to be transformed into an institution, even if it takes place in the most honorable form." Wow, I think this is why people really uphold him as one of the great public intellectual of 20th century. France did produce quite a number of public intellectuals the likes of Michel Foucault, Pierre Bourdieu and Jean Braudillard which I personally read some of their writings and interviews. ( Google the debate Foucault had with Chomsky.Very nice to watch). I just got to know the story this week that we do have one. It is none other than the late Rustam A.Sani. I rarely heard about his works until I discovered his writings in Siasah, which I have always bought every week since 2 years ago. I never knew that he was a respected academician (he once was a fellow in Malaysian premier think tank-ISIS). Of course he left the think tank later due to incongruent working atmosphere in ISIS that hindered his vox populi spirit. The shockest news I heard after his death was that, he actually had a father by the name of Ahmad Boestaman! Well, for history buff like me, the name will always signal about the purest nationalism form of struggle side by side with the likes of Dr Burhanuddin Helmy and Pak Sako of PKMM in their quest for Malayan Independence. As a son of one of the respected Malay nationalist of pre-independence years, surely he walk beneath his father’s shadow. I guess I was wrong today. Much can be said about the ‘real Rustam’. I was a bit ignorant about him. That was before I came to his book launching session just now, which being officiated by Anwar Ibrahim. Lots of political celebrities were there just now, which taking place at Selangor State Library in Shah Alam. Not to mention literature figure like A.Samad Said as well the renegade liberalist -Hishamuddin Rais was also there to pay last tribute to this great man. Its better for the readers to get a copy of Siasah that just came out yesterday and check out some of the comments about the late Rustam. Even Prof Jomo managed to write a piece of tribute that was given to the attendees of the event. Prof Jomo and Rustam was comrades in academics I supposed. It’s a sad thing for me because I never take any heed to learn more about this great man when he was alive. Nonetheless I will dig his writings that have been published in his two books that I bought 5 hours ago as well from his Suara Rakyat blog. Public intellectual of today not only left their writings and ideas in form of books but also blog! I wonder what would I left later if I were to be a ‘public intellectual’ like Rustam…May Allah bless his soul. Enjoy the picture of Pakatan Rakyat celebrities that have attended the book launching just now! P/S 1: I did salam Anwar just now but that does not mean I agree with everything he said furthermore to call him my idol! I was wondering in the car just now whether the big crowd was there to pay tribute to the late Rustam or just wanted to take a glimpse of Anwar Ibrahim who recently made headlines about party hopping scheme .Malaysian after all, use their emotion more than their faculty of reason when it comes to political discourse and surely Anwar packs a punch in that department! The Selangor State Library entrance. Anwar having a chat with Rustam family members. The old bloke of Malaysian socialists. Tuan rausyanfikir..Majalah apa yang ada gambar Buya Hamka di frontpage..sangat menarik!.. Ilmu palsu: Perangkap samar di menara gading.